The poor chickpea. 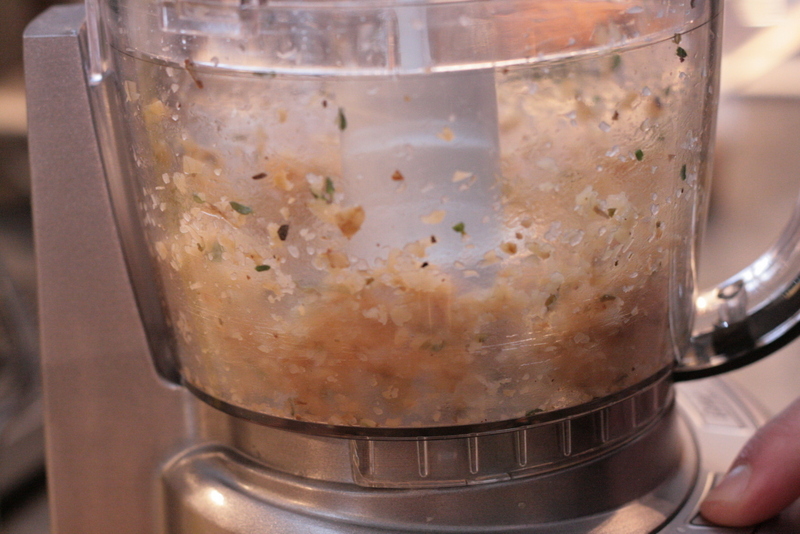 It’s either pulverized for hummus or banished to the salad bar to be glared at and ignored by salad eaters. But not anymore. I decided to step out of my comfort zone and make something a little different, a Moroccan stew. 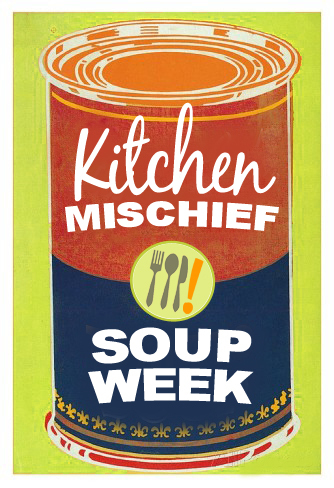 Yes, I know this is soup week and this is not called a soup…tomato, to-mah-to, I say. You will see that I have chicken in my stew. If you want to go meatless, leave it out! I won’t judge…maybe. Let’s get this stew started! Heat olive oil in a dutch oven over medium-high heat until shimmering. Add onions, sprinkle with salt and cook for 5 minutes, stirring occasionally. Add garlic, tomato paste and cook for an additional minute. Add tomatoes, cumin and cinnamon. Cook for an additional two minutes. 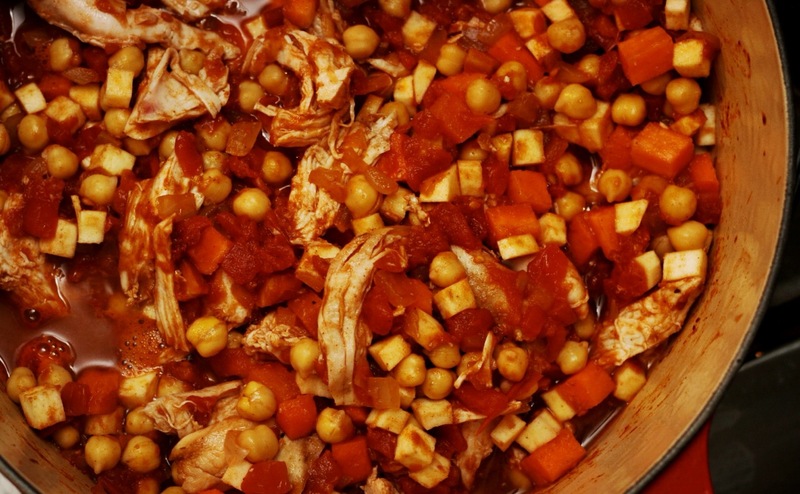 Add chickpeas, chicken broth, parsnips and carrots. Stir to combine. Bring to a boil. Cover and reduce heat to a simmer and cook for 40 minutes. 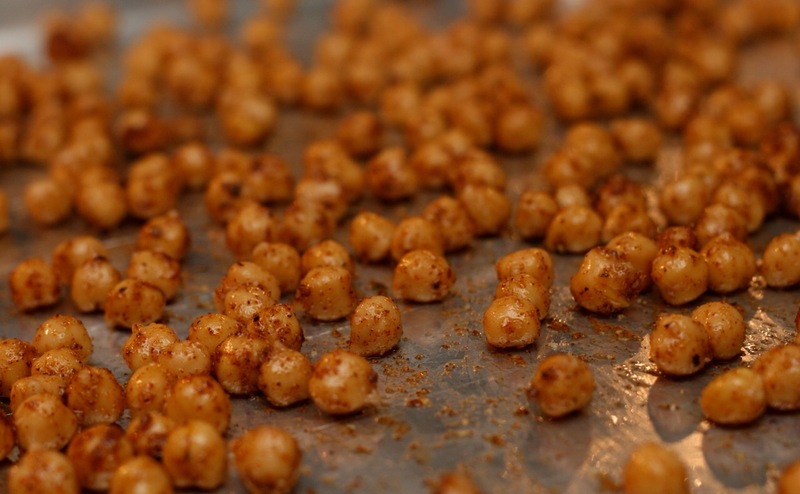 After 40 minutes, use your potato masher and mash chickpeas a little. I would say around 10 mashes would do it. This is not soft-focus, it is steam. I served it with a little jasmine rice but you could substitute for couscous. Josh and I found this one online and it looked really fun and tasty. Preheat the over to 400°. 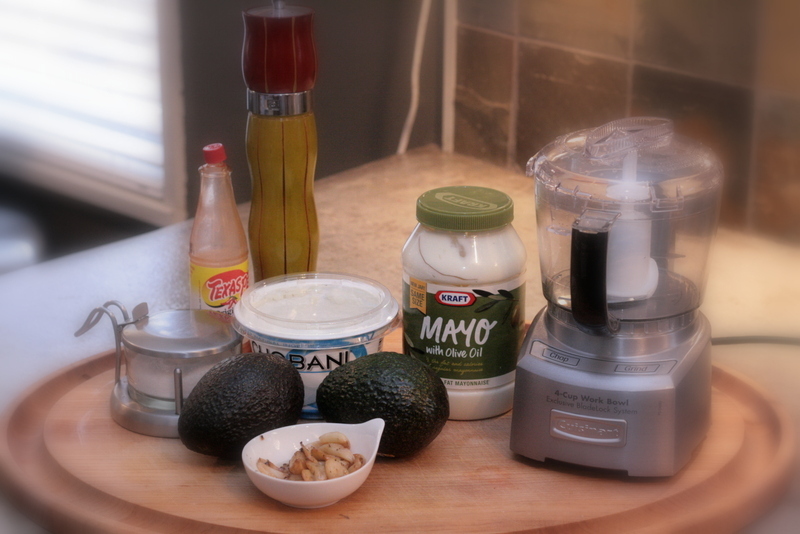 Combine all ingredients in a bowl and mix. 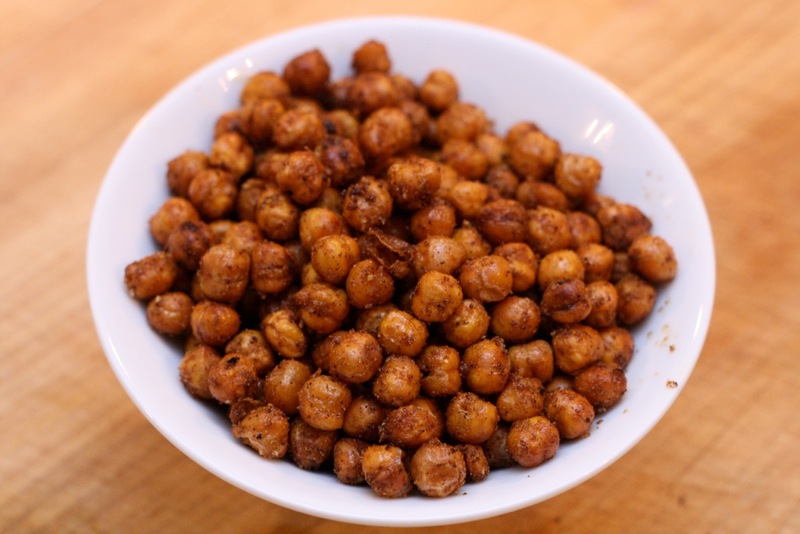 Spread chickpeas in a even layer on sheet pan. Roast for 35-40 minutes or until crunchy on outside but tender in the middle. I love this Thai chicken coconut soup. 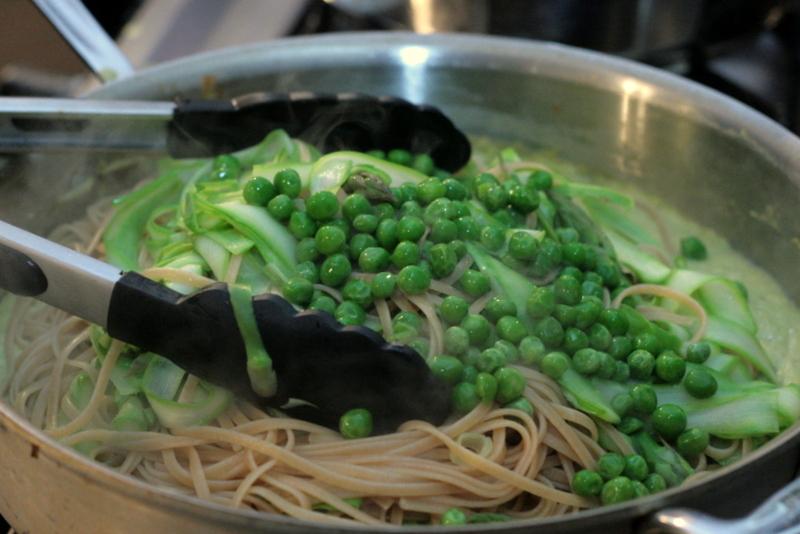 You can eat it as is or add various noodles to make your favorite noodle bowl. I know when you see the ingredient list below you may think that I ransacked an Asian market but I really bought most of this at our local mega mart and maybe Whole (Paycheck) Foods. 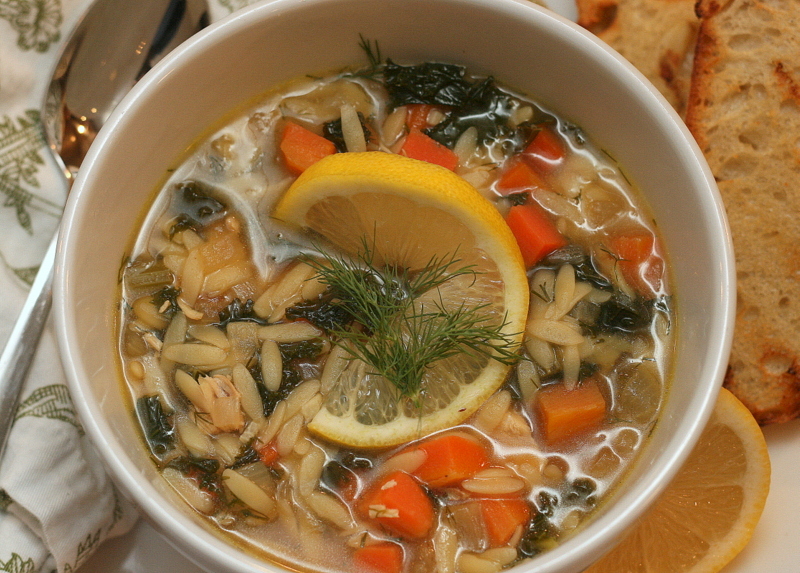 Believe it or not, this soup can be on your table in less than hour. A few things before we get to the recipe. The original recipe calls for fish sauce. 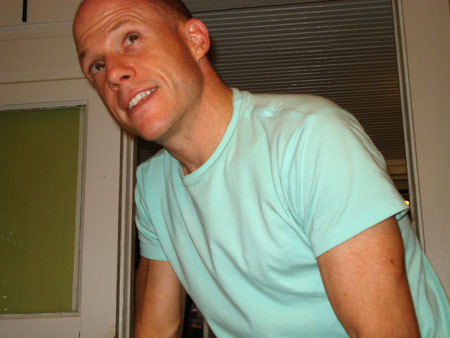 We cannot use fish sauce in our house because of Ray’s allergy (so he says) to fish. Soup should be warm and comforting, not send you to the hospital. So I substituted soy sauce for fish sauce. Also, I was able to find lime leaves at Whole Foods. 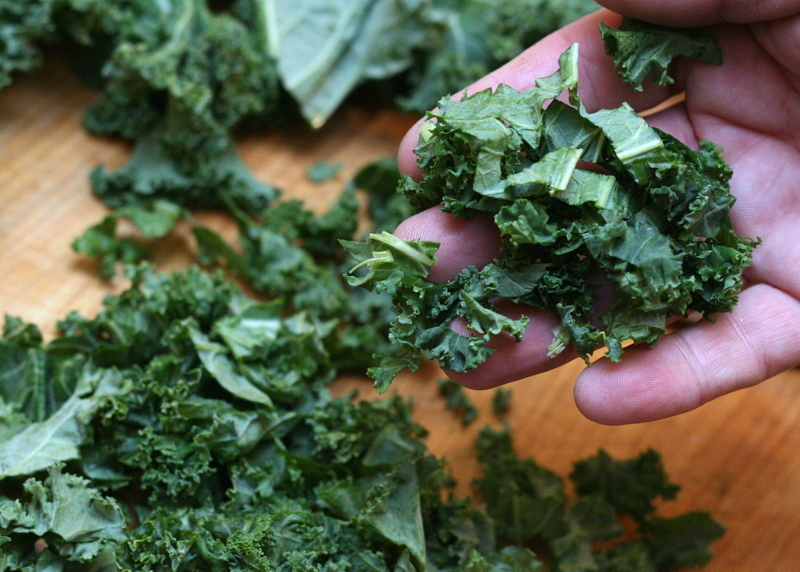 These little babies are cheap and pack a punch (steep them in a good green tea). 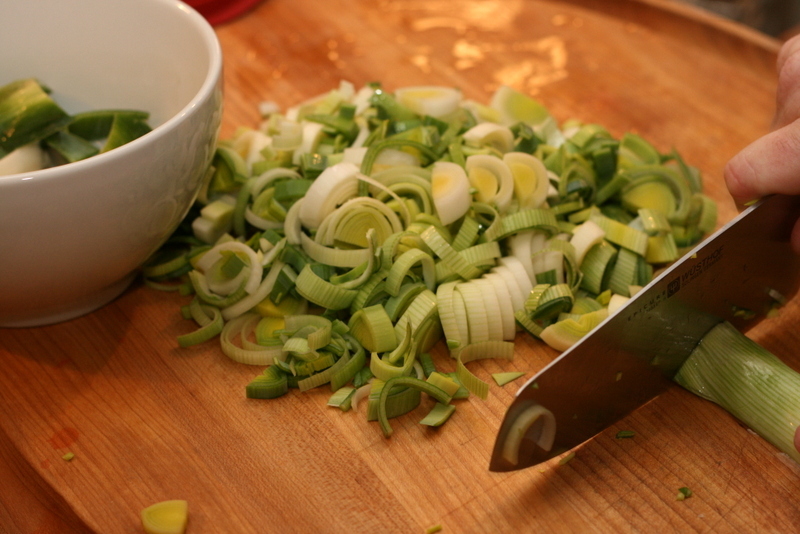 If you can’t find them, use a vegetable peeler to remove a few strips of zest from a lime. Last thing, if you can’t find Thai chilies – use Serrano chilies, they are a staple in most mega marts. In a stock pot, add the chicken broth and heat over medium heat. 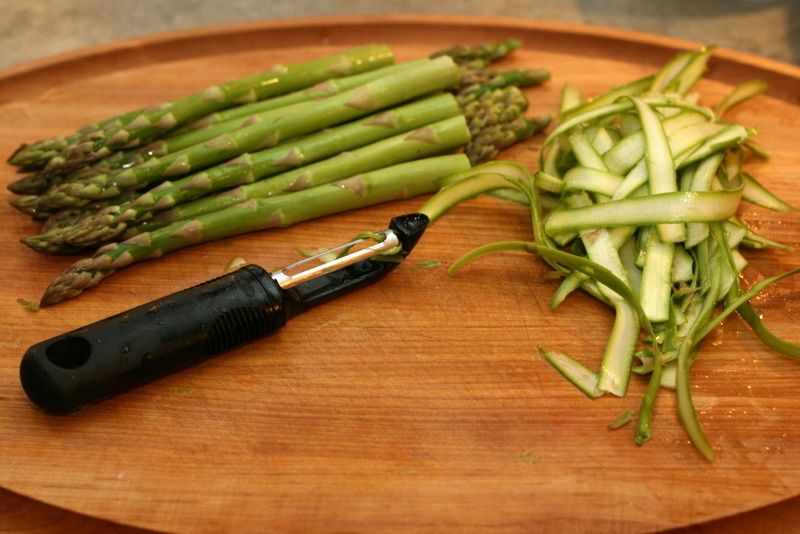 With the back of a heavy knife or rolling pen, whack each piece of lemon grass to open the stalks. 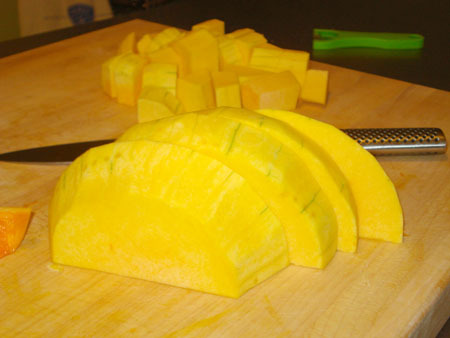 Add lemon grass, ginger, chilies, lime leaves and pepper corns to an 8”x8” piece of cheese cloth and tie into a bundle. 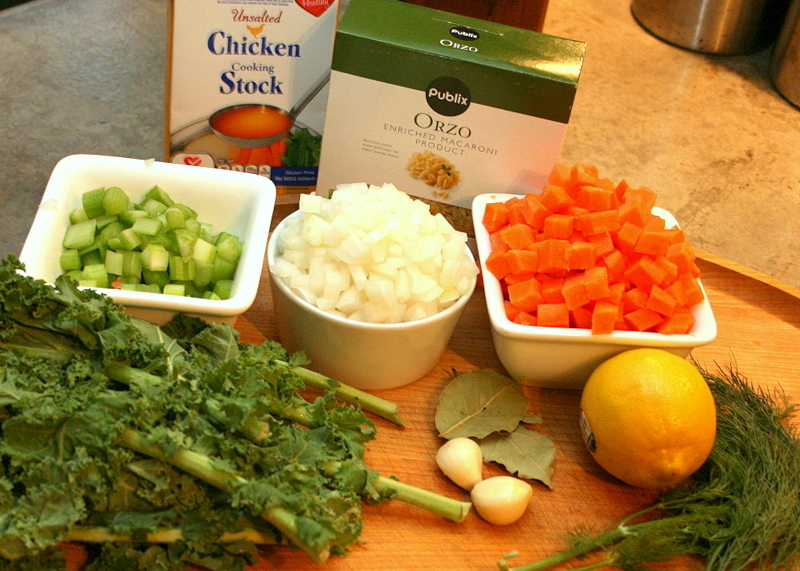 Add bundle and diced chicken to broth and simmer for 15 minutes. Stir in coconut milk, chili-garlic sauce, chili oil, soy sauce and tofu. Simmer for 10 additional minutes. 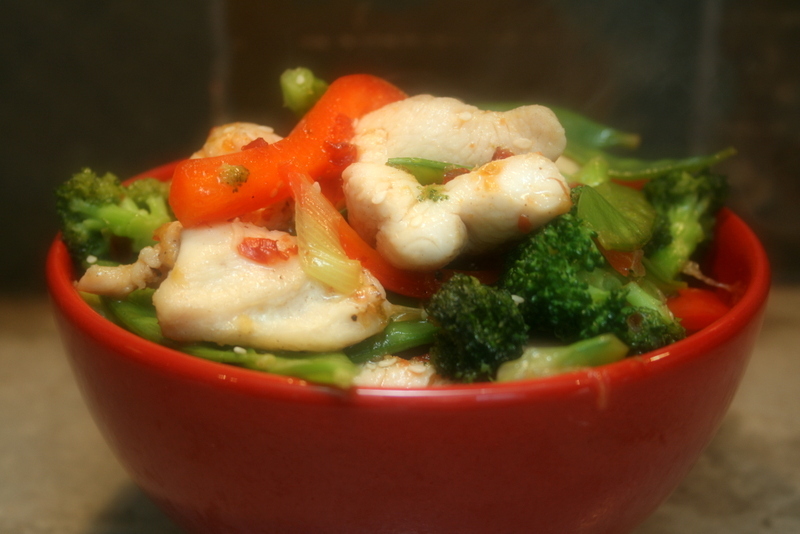 Serve with scallions and mushrooms. Let’s keep the mischief to a minimum when it comes to working with chilies. These bad boys are HOT! So here a few tips for keeping the heat down: When working with any kind of chili, wear gloves to keep the oils from burning your skin. It may not burn your fingers but wipe your eye or nose and the phrase “feel the burn” has a whole new meaning. To make chilies a little less hot, remove the seeds and ribs. Holding your knife horizontally, slowly cut out both. First, a note on the quantities here. Plan to have some extra broth. 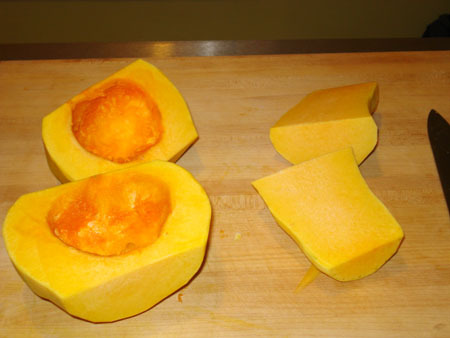 It’s hard to find a squash the exact right size, so you may have to add more liquid to get a consistency you like. Some folks like it thick, some thin. It’s entirely up to you. Roasting the vegetables is the key to adding rich flavor to this soup. So go ahead and set your oven to 400° before you start chopping. 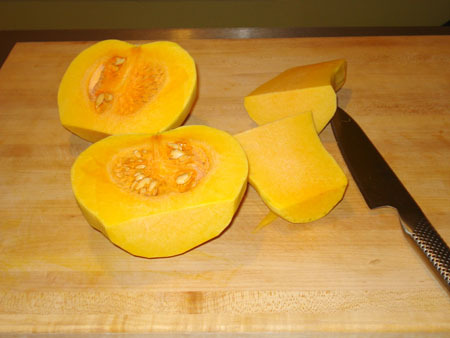 Don’t be intimidated by this squashy beast. Just think of her as a pale, rather elongated pumpkin that you’re going to peel like an apple. 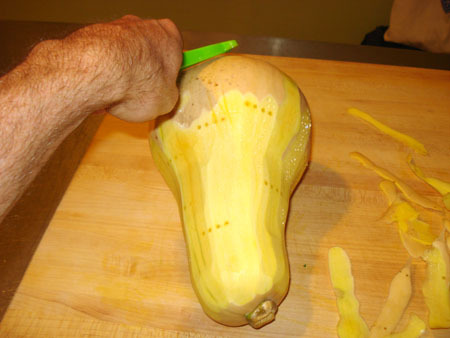 TIP: Poke the squash a few times with a fork and microwave it for 40 seconds. It helps with the peeling. The “base” has seeds, the “neck” doesn’t. It’s easy to get excited during this step, but please be careful. I almost ended up with a hook for a hand. And the winner is…Squirrel! 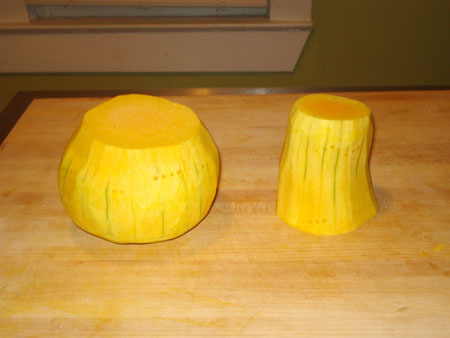 Take that, Butternut. Now you are but rubble on my Boos Block. Sorry, out of pics, but the rest is pretty simple. Peel your carrots, and give them and your onion a very rough chop. 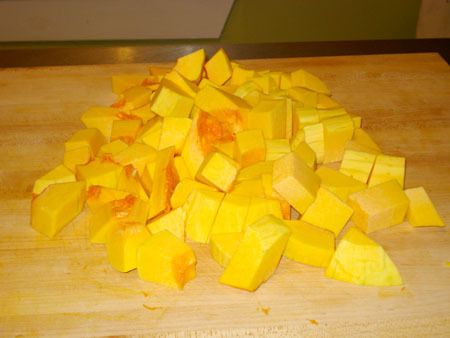 You want big chunks so they cook along with your squash. Toss all the veggies in a bowl and coat with olive oil, salt and pepper. Empty onto a cookie sheet, and roast for 45 minutes. If you’d like to add the flavor of roasted garlic to your soup (which I love), simply cut the top of a head of garlic, set it on a piece of aluminum foil, drizzle with olive oil, and wrap it up. It will roast to perfection along with your veggies. This is the least messy option. 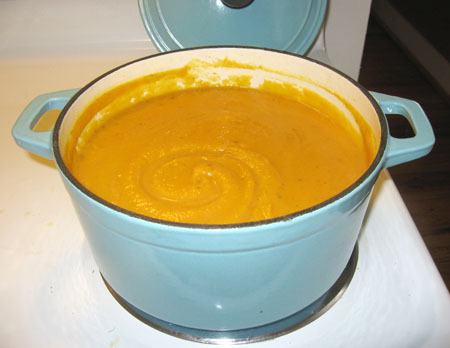 Start by combining your milk and broth in a large dutch oven over medium heat. 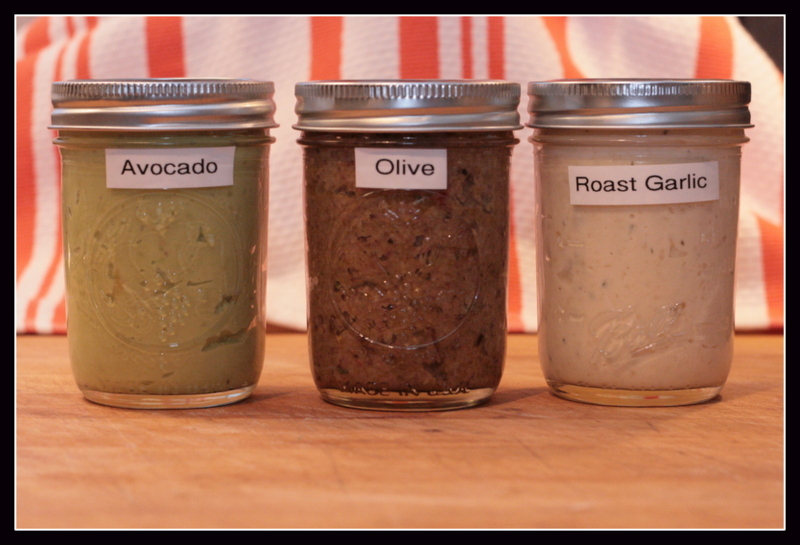 When it warms, add half the roasted vegetables (and all garlic, if using) and blend until smooth. Simply add the rest of the veggies and repeat. If the soup is too thick, add more broth or milk. Season to taste. 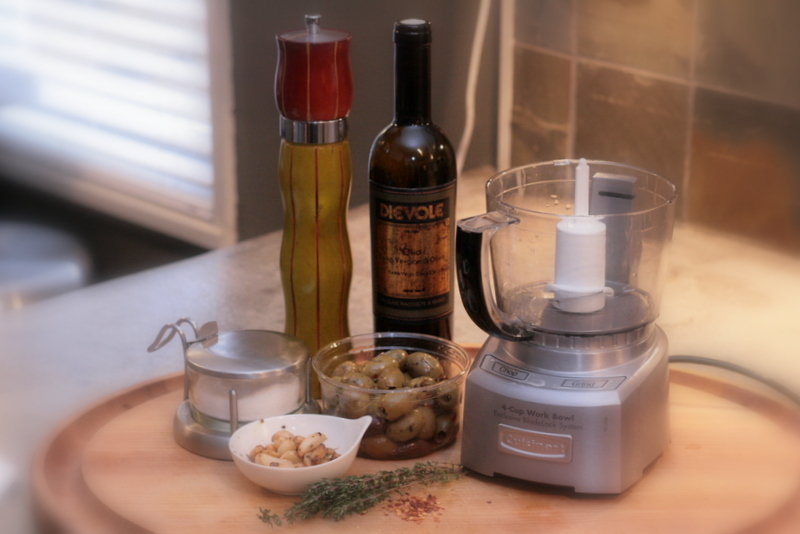 Want to know more about stick blenders…read Matthew’s post here. 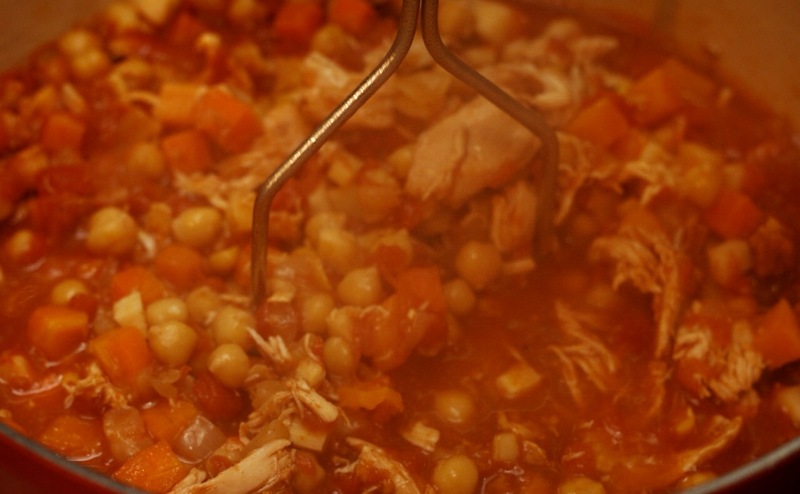 These methods are pretty easy, and result in a smoother texture for the soup. 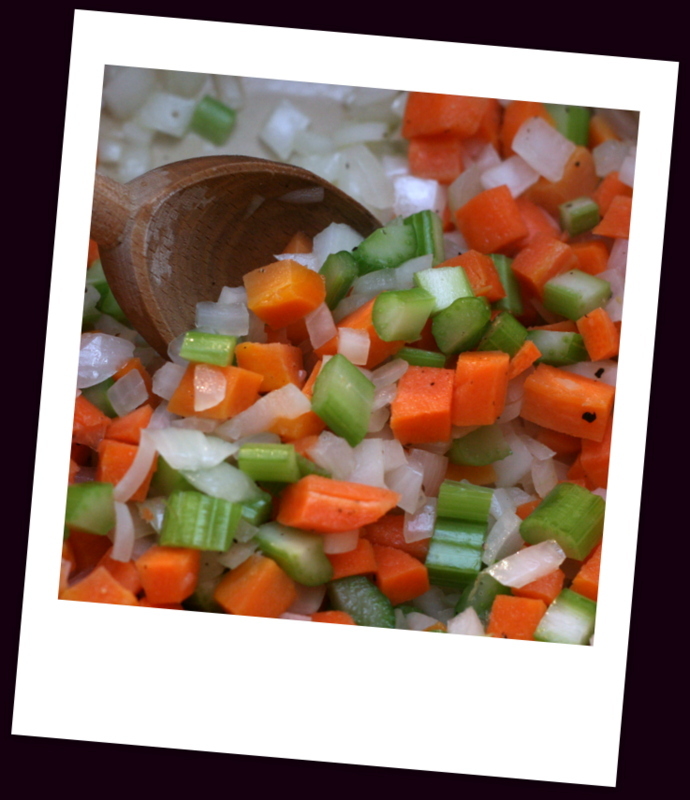 Work in batches, combining half the liquid mixture with half the veggies, blend, pour into dutch oven, then repeat. Heat to simmer then season to taste. 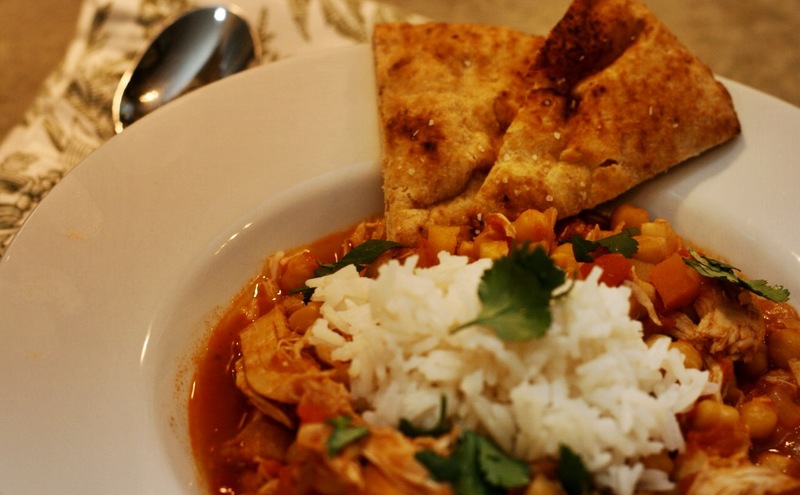 If you like exotic flavors, add a tablespoon or two of curry powder to the soup while it’s simmering. I’m not a huge curry fan, but it really works with this soup. You can also use thyme, sage, fennel, smoky paprika — just be sure to use ground spices to preserve the soup’s creamy texture. Toppings make this soup even more fun. I love toasted walnuts and crunchy bacon, but get creative and see what you can come up with. 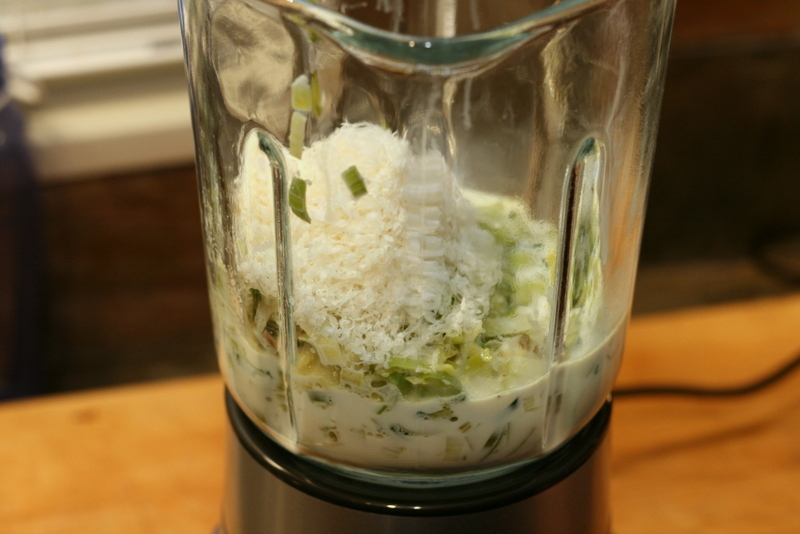 Barefoot Contessa tops hers with cashews, green onions, banana and coconut. Crazy! The possibilities are endless. After enjoying a night out with my favorite mischief-maker, Josh Miller, who needs some easy comfort food that didn’t break the calorie bank? This guy! 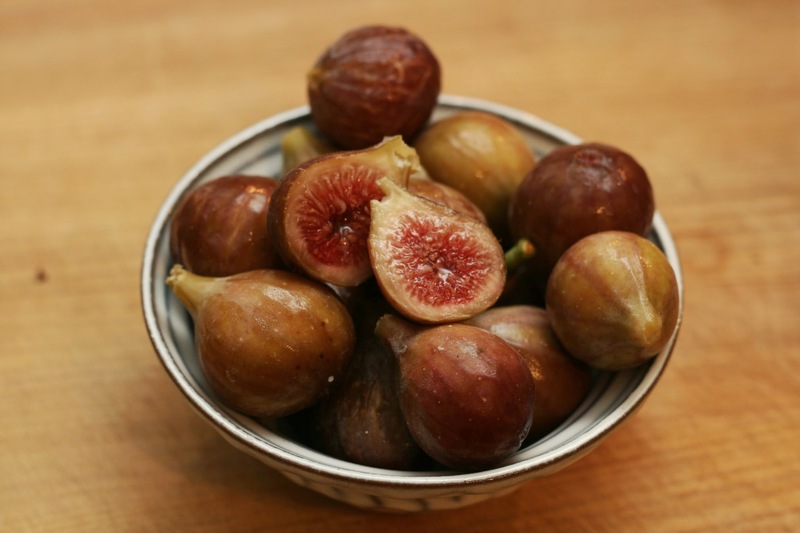 After taking inventory of the fridge and the fig tree from my neighbor’s yard (thank you, Keith! ), I just needed a few ingredients for my recovery meal. Most of the recipes below only have a few ingredients. 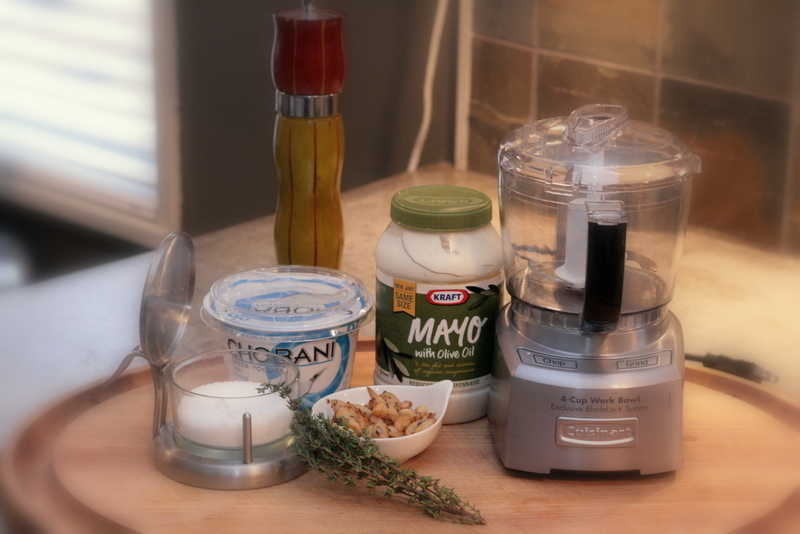 I keep most of these ingredients on hand. For example, prosciutto is a great, low calorie substitute for bacon, so I grab some from one of the mega wholesale places when I go. Here are the simple dishes I made this Sunday to make me feel better. Preheat grill. 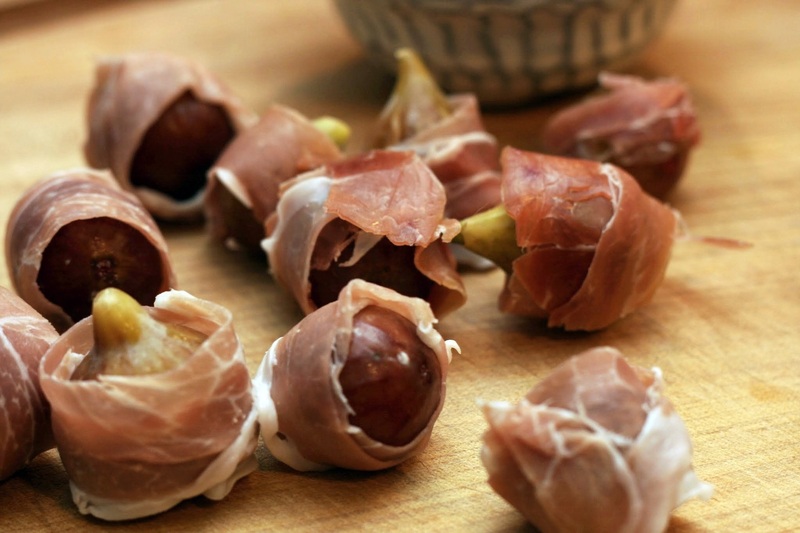 Wash and pat dry figs. 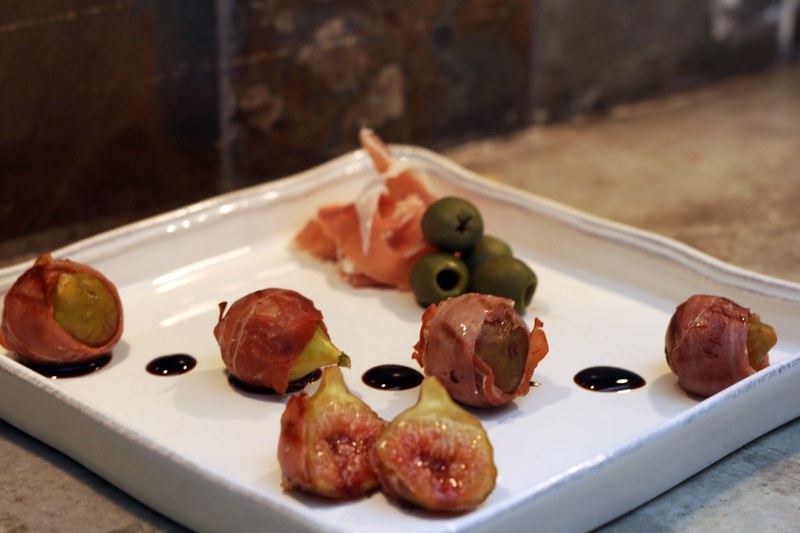 Wrap prosciutto around each fig and place on grill set at medium heat (350°). Turn every 2-3 minutes (8 minutes total) until prosciutto is golden brown. 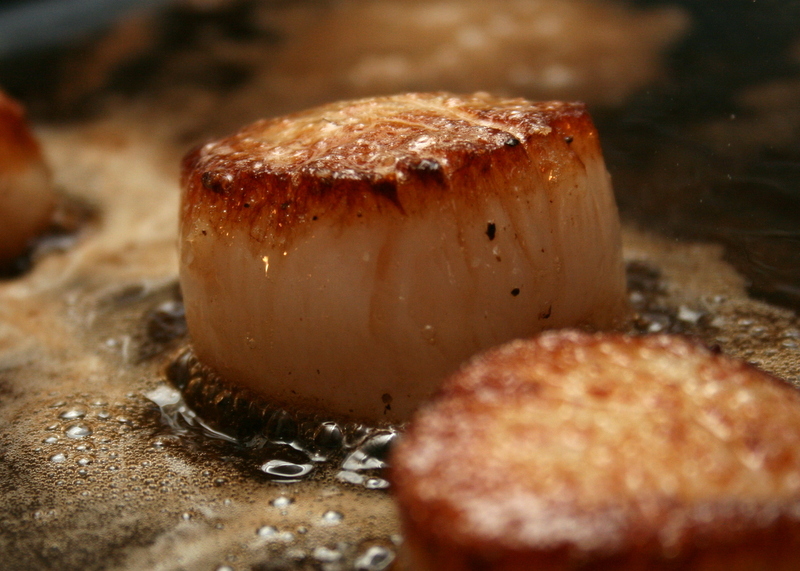 Place on tray and serve with a dollop of balsamic reduction. 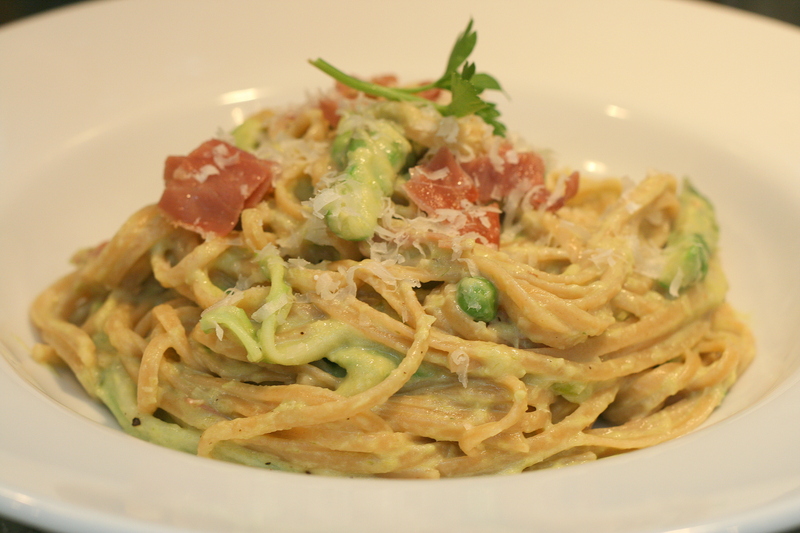 I stole this EASY and tasty dish from Bottega Cafe. This is a very simple way to use those farmers’ market tomatoes that may be going bad. Wash and dry tomatoes. 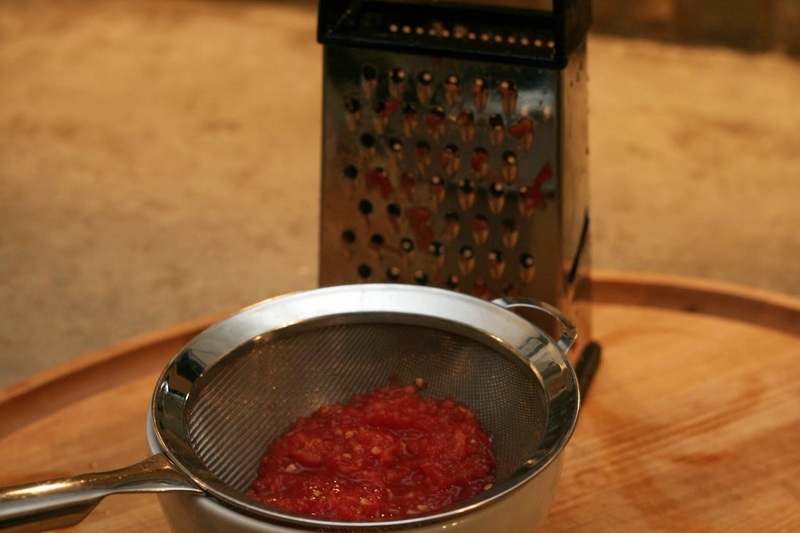 Using a box grater, grate the tomatoes on the course side – flesh, seeds and all (disregard the skin left). 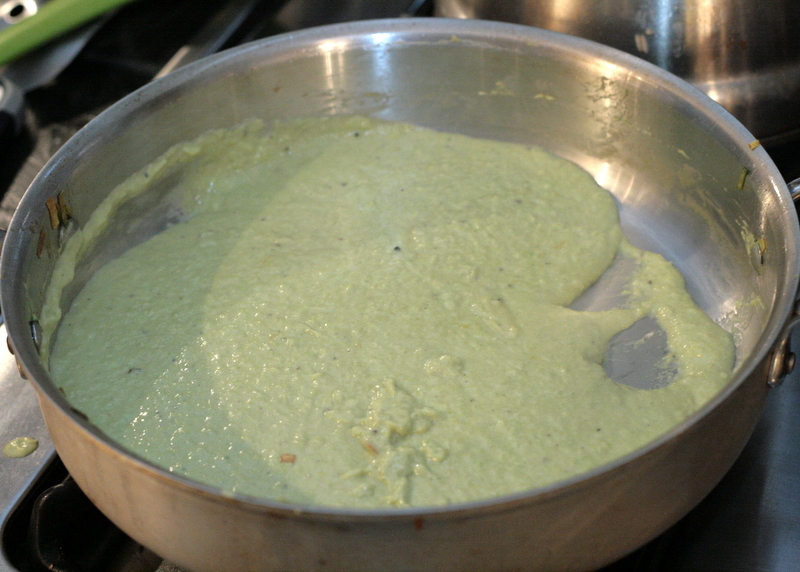 Place the pulp in a sieve or fine mesh strainer over a bowl for 10 minutes. 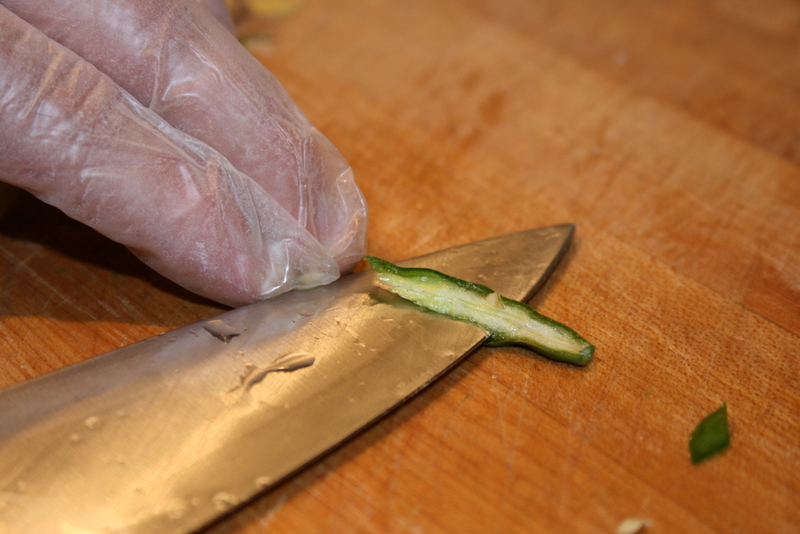 Don’t grate a finger or knuckle…it would blend in! While that sits, brush bread with olive oil and sprinkle with salt and pepper. Grill bread until edges are chard and grill marks appear. 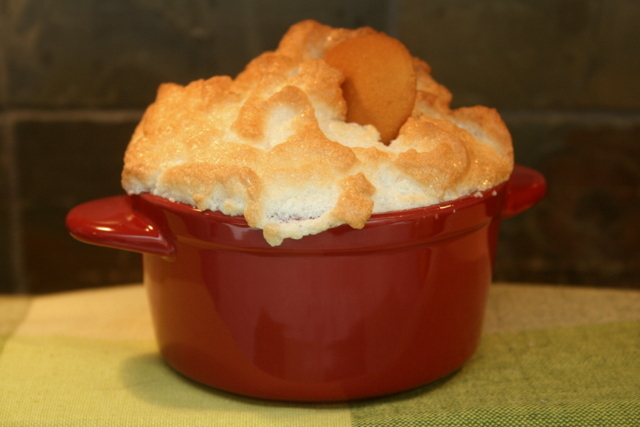 (You can use your oven broiler – just watch it, I always burn mine). Once the bread is toasted, rub a half clove of garlic on one side of the bread. Do that to each piece and place aside. Place the strained tomato pulp in bowl. Add salt and pepper, mix to combine. 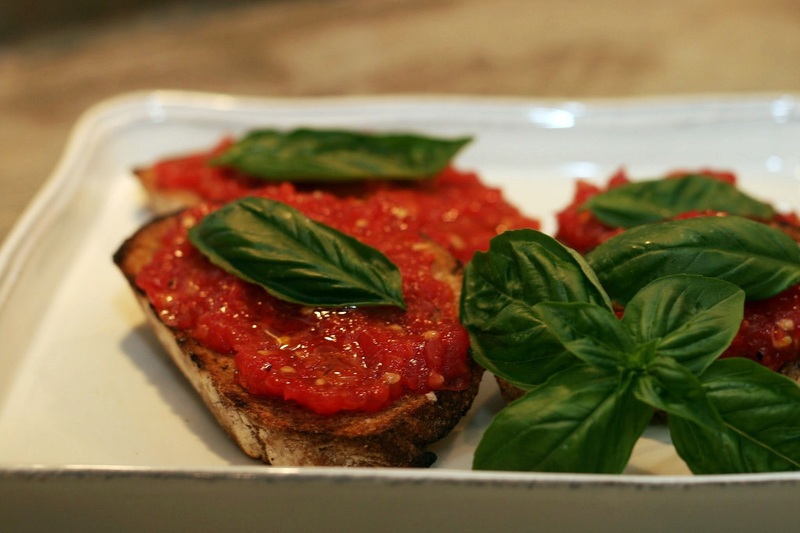 Spoon the tomato mixture evenly over each piece of bread, drizzle with olive oil and top with a basil leaf (can be torn). 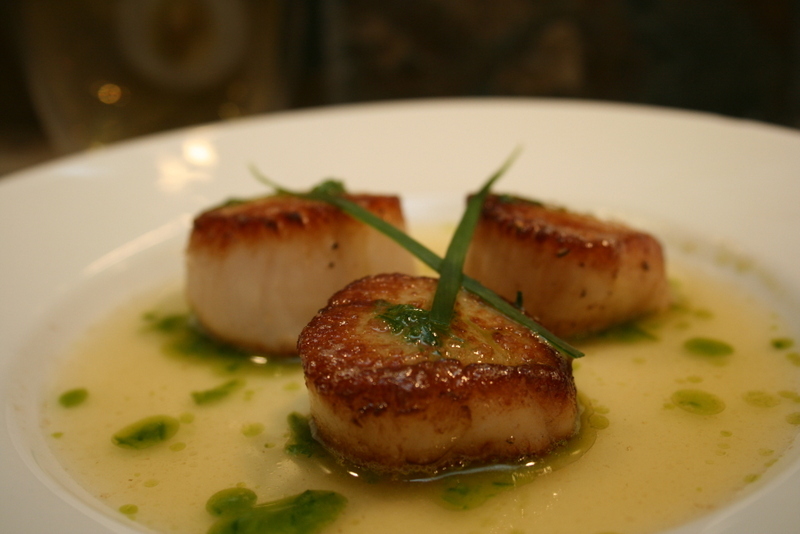 Fresh, easy and very tasty. This is very easy dish and comforting dish. 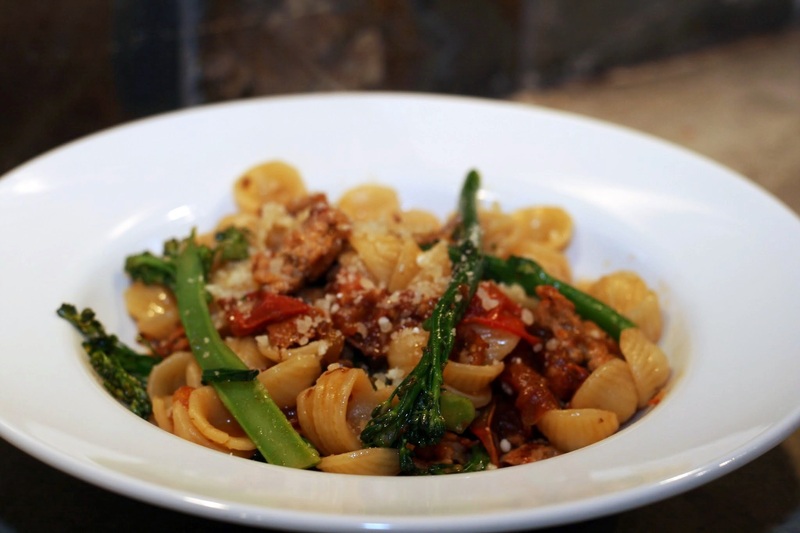 You can use any pasta but I love these little orecchiette from Whole Foods, I do suggest, have you pasta 80% done before starting the sauce – it is very quick (8 minutes total). This makes two large servings. Follow package directions for pasta. With three minutes remaining in cook time, add the broccolini to pasta water. 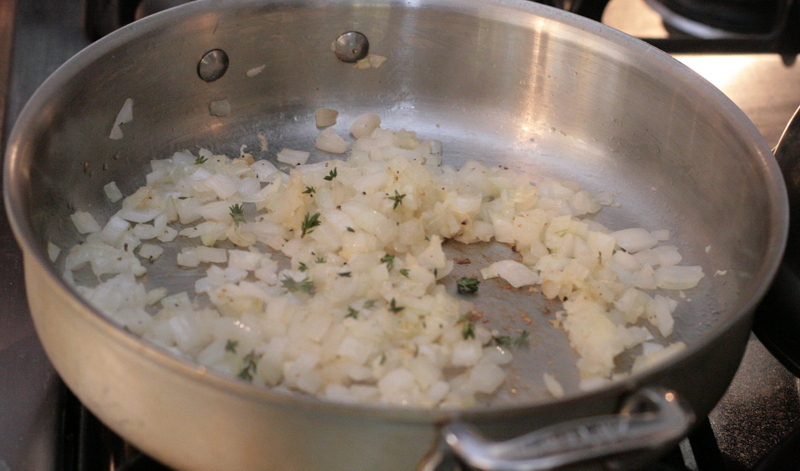 While that cooks, preheat olive oil in saute pan over medium-high heat. Add sausage and use tongs or spoon to break up the pieces. Stir for 2 minutes, breaking pieces as you go. Add shallots and cook for one minute. 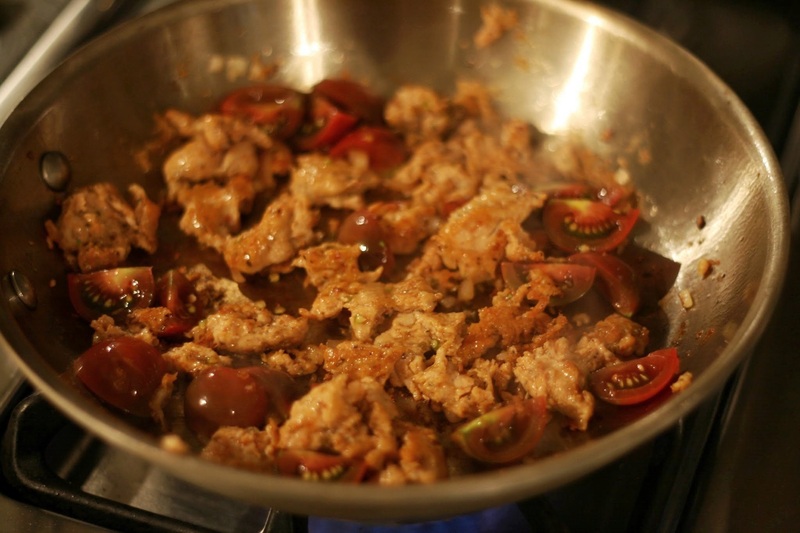 Then add tomatoes and stir to combine. 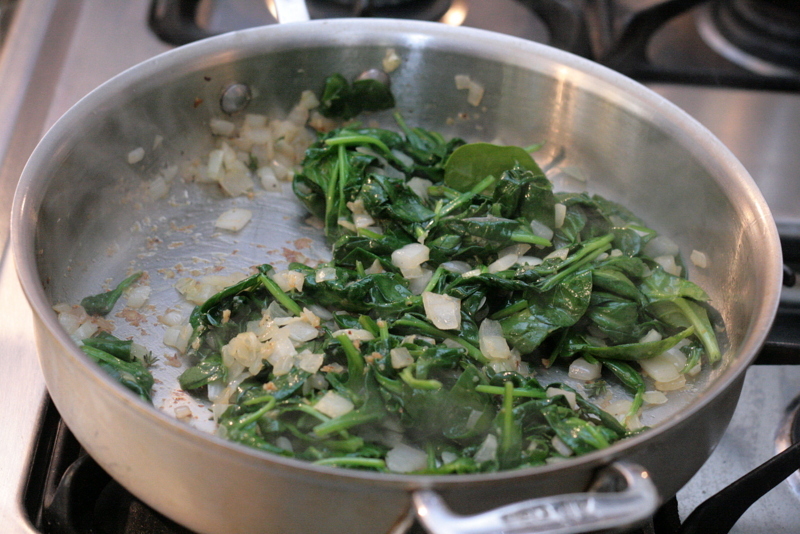 Using tongs, grab the broccolini from pasta water and add to pan. Stir to combine. Using a ladle or measuring cup, add a 3/4 cup of pasta water to the saute pan. Reduce to medium heat. Drain pasta and add to saute pan. Fold to combine. Remove from heat and sprinkle with cheese. 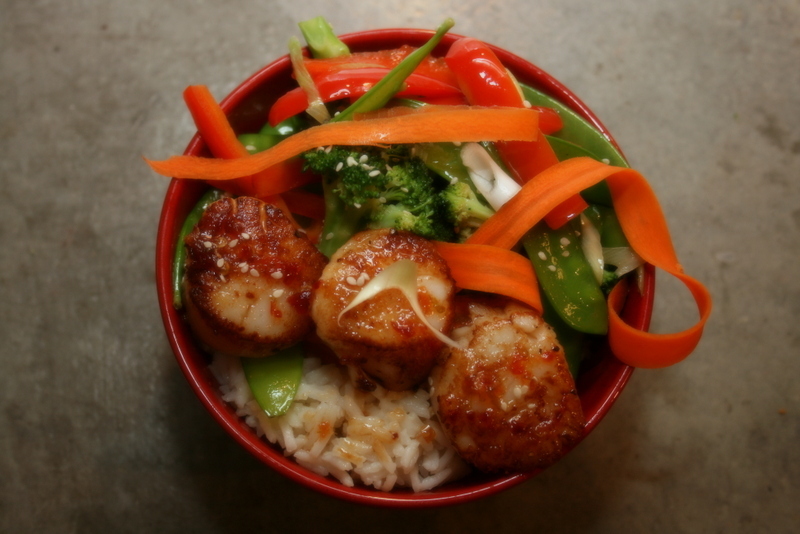 Simple, spicy, warm, comfort food. This dishes are easy to make and delicious to eat. My absolute favorite is the Pan Con Tomate – you can’t get any simpler than that. All pictures by Ray Hydrick. Josh first posted about his recreation of his favorite burger in March, 2011 and since then he has been adding to his repertoire of tasty creations. He told me about making a turkey burger with spinach and feta. Sounded delicious! So rather than steal this recipe fair and square, I decided to change it up a little, take the ingredients and turn it into a meatloaf. 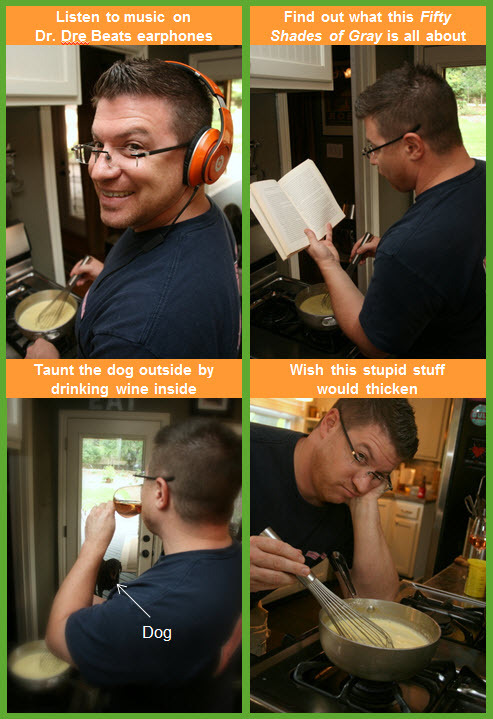 A recipe tag team of sorts. The key to any meatloaf and especially turkey meatloaf is keeping it moist. 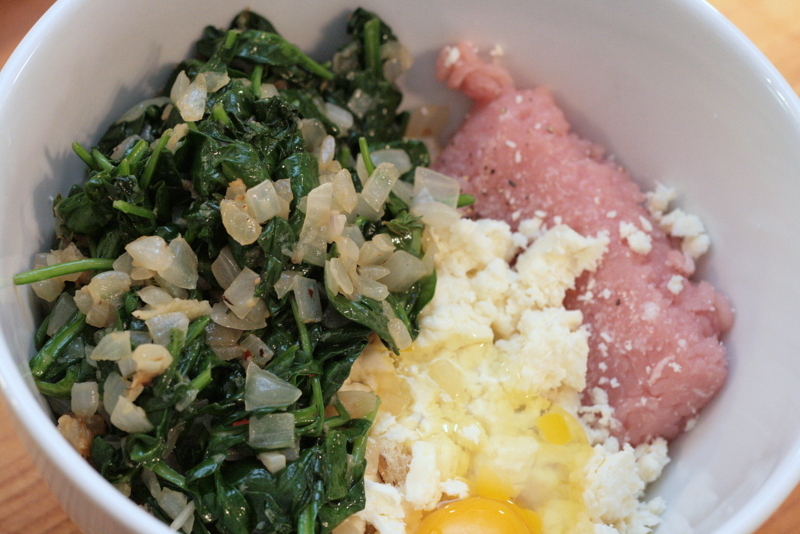 The moist-making lineup for this meatloaf is sautéed spinach and an egg. Since spinach is mostly made up of water, it is the perfect addition. The other technique I used to keep the moisture is cooking it faster. Ever had a really…I mean really dry meatloaf? It usually is in one big loaf. I decided to make four smaller ones to allow it to cook faster. Don’t have a small loaf pan? No worries. I have that covered. Pre-heat the oven to 375°. 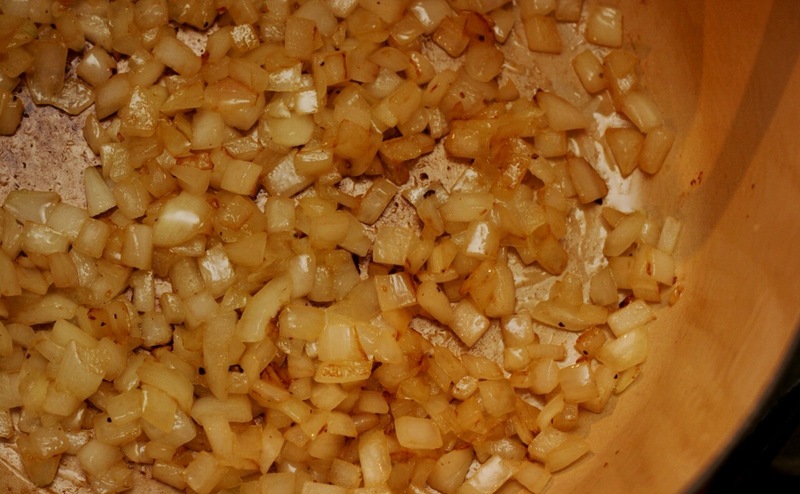 Sauté the onion in the olive oil over medium-high heat until tender and translucent. Add the minced garlic, thyme and red pepper flakes. 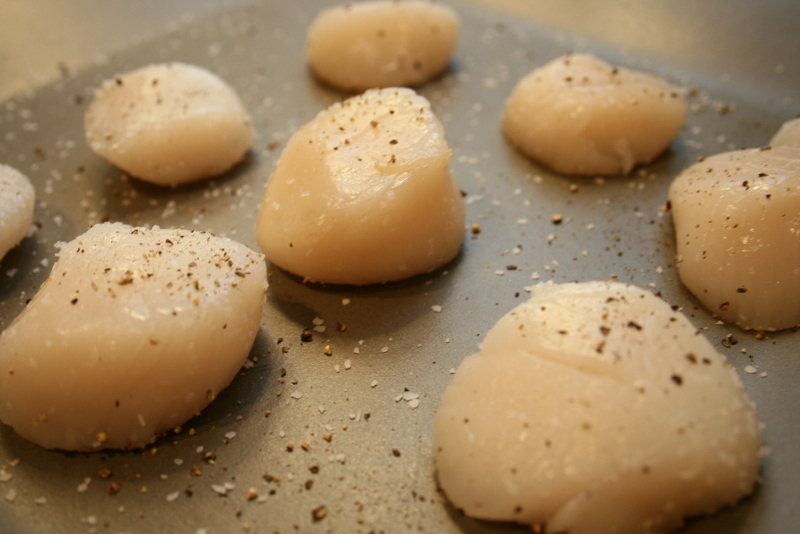 Sauté for one minute – keep stirring so the garlic doesn’t burn. Add the package of spinach. Sprinkle with salt and pepper. 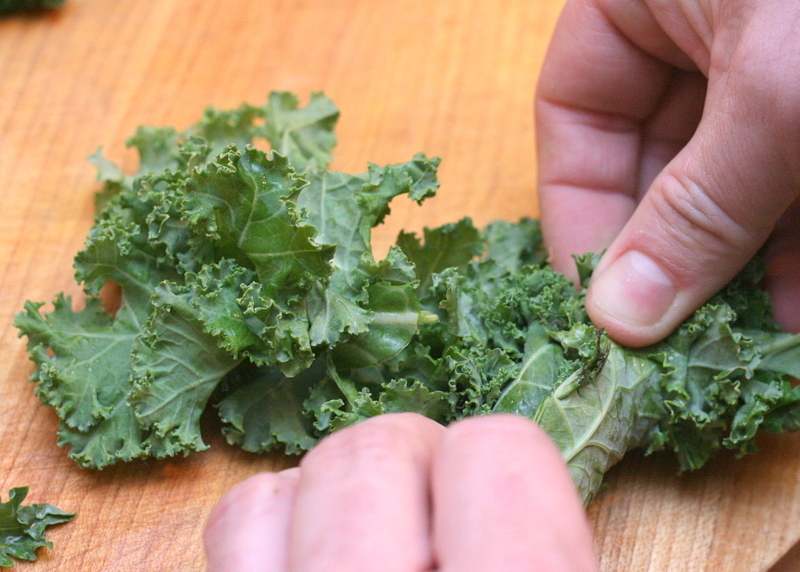 Using tongs, turn the spinach until wilted. 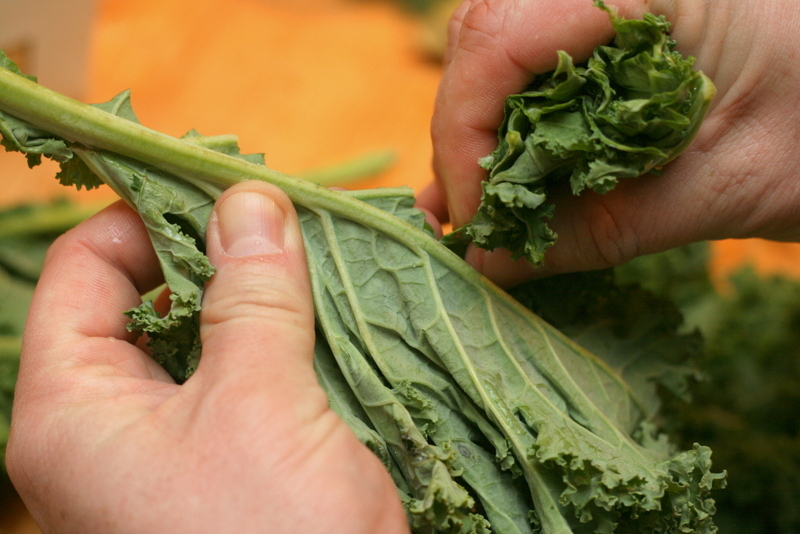 Place on a plate to cool (hot spinach in cold turkey could create a perfect place for bacteria). 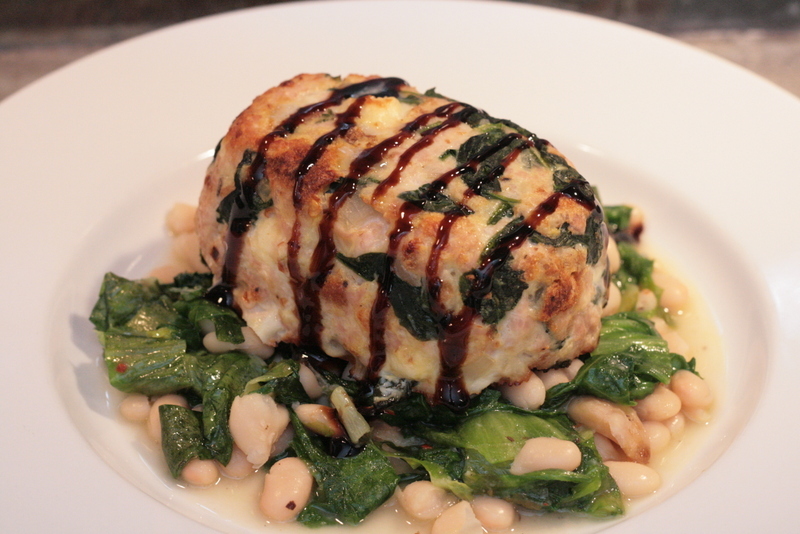 In a bowl, add ground turkey, spinach mixture, egg, bread crumbs and feta cheese. Mix completely but don’t “squish it” – that makes it very dense. If it grosses you out to mix with your hands, then good luck. 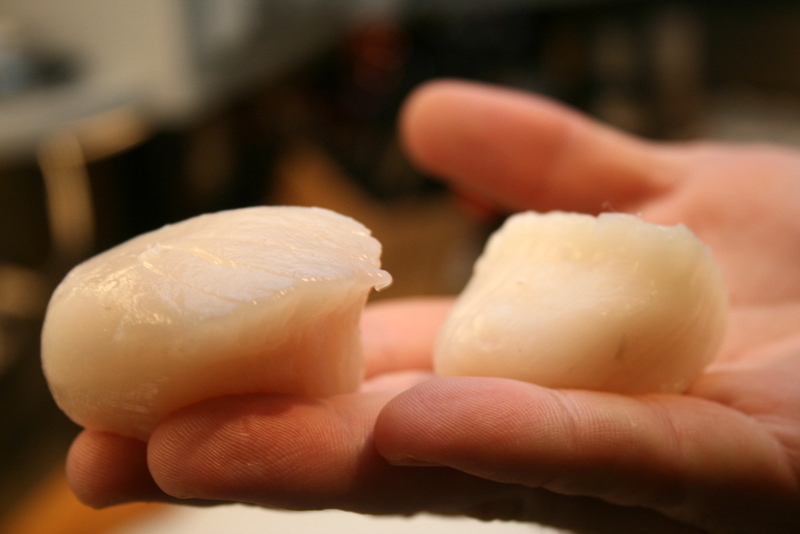 This is the fun part – place a piece of plastic wrap in a small plastic container. Spoon in the turkey mixture and press gently to compact. Turn the loaf out on a parchment-lined sheet pan. 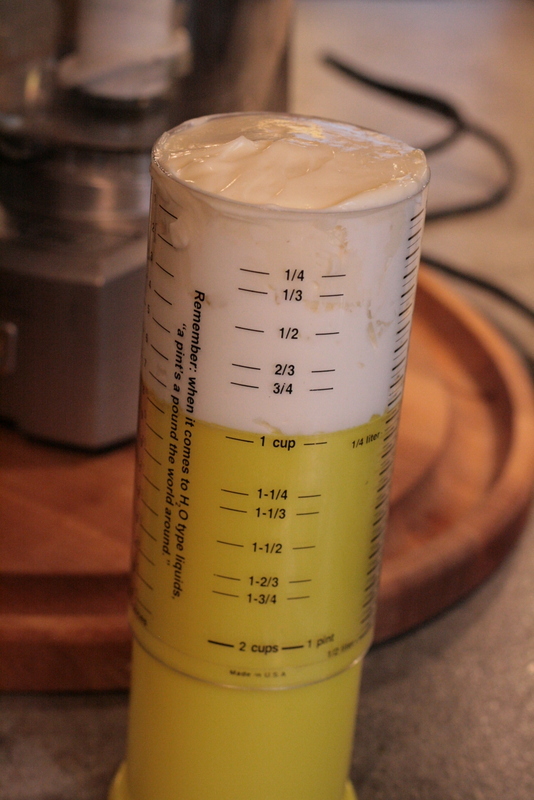 Complete the process until the mixture is gone (mine made 4). Click on the pic for a better view. Apparently, my computer wants to give you an eye exam. 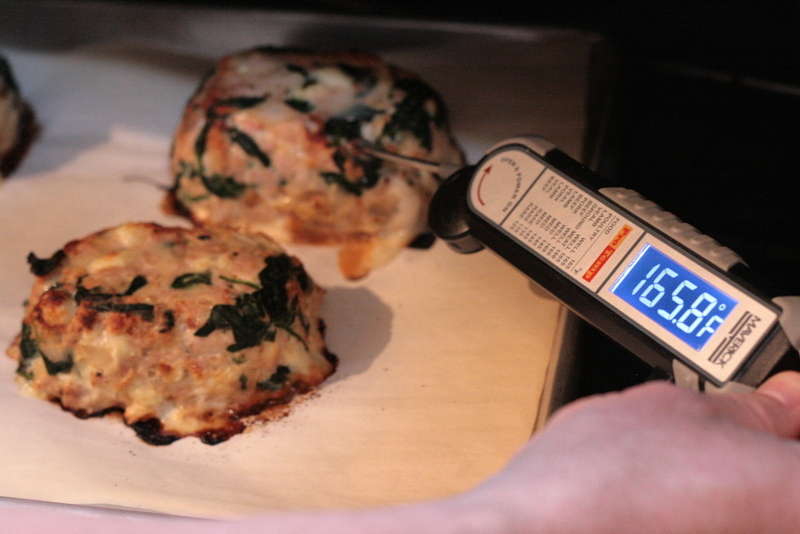 Place in the oven for 30 minutes or until the thermometer reads 165°. Let them rest for 5 minutes before serving. I ditched the traditional tomato slather and went for a balsamic reduction drizzle (I found mine at a specialty food store). I served mine over sautéed white northern beans with thyme and escarole. Delicious and healthy! P.S. – I told Josh that I stole his recipe. After he cut me in Publix Supermarket, he was fine with it. I just think he was just hungry. P.S.S. – I cannot confirm that Josh cut me.